Hi guys! It’s been a long time since I haven’t done any Dolly Profiles so here we are. We’re featuring an atelierniSHASHA pioneer – Shiori Fukuda. Sigh... I really love that cute face, dotted with those almost puckered up red lips. Shiori is a film student from Japan who likes to travel the world in her spare time. She frequents film festivals and theater shows with her like-minded friends. likes to bring her artistic influence to street chic dressing. But when Shiori dresses up for formal events, she likes to give it a bit of a drama. She is fascinated by period dressing so naturally, she would take some bits of inspiration to the atelier. I would be more than glad to play along with her as I don’t come across such projects often. Of course, there would be times when I would be the one to ask her to model some of my new creations. I thought she’s perfect for these outfits I made back then. she’s just be happily wearing comfy clothes that I happen to enjoy making more often. I am planning to make Shiori something grand, something she really likes, before she goes to Berlin to chase her dreams. She may occasionally visit the atelier in between her hectic schedule, but for now, I’d just wish her all the best. online Japanese doll collector shop in 2010. Currently, she is nursing a broken neck, thus the absence of new photos. I’m currently looking for ways to repair her neck, and hopefully make her model for me again. so cute! i like the shorts (pants?) in the second photo! Thanks so much, Anika! Actually, you just opened my eyes to new possibilities! 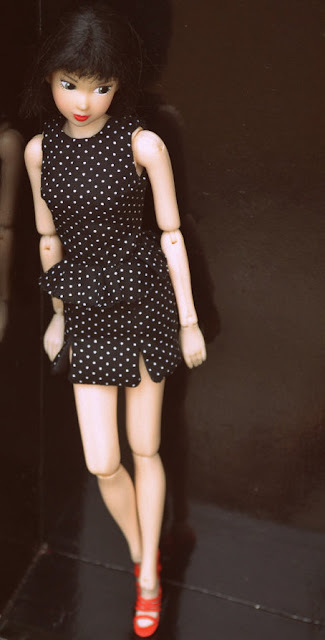 I never really considered rebodying my Momoko's but I will try and report back to you guys! Thanks so much, dear! Sigh.. I just found out that I sat Shiori's head next to a staining kind of leatherette and now she has a stain on her left cheek. I felt so bad for neglecting her for so long =( I may need to research other ways to remove the stain because acetone didn't help. You can use Benzac :) You can buy it from drug stores. They cost around 300 pesos in Mercury drug stores. Very effective in cleaning any stain on dolls. It's an acne cream, but works really well on dolls. You just apply it on the stain, and leave the doll under the sun (for the cream to dry up). DO this everyday until the stain is gone. It will light up day by day.. it may take a while, though..
Oh, Jelyn! Thanks so much for confirming this, dear.. I did hear of this Benzac cream from US collectors but too lazy to research for local versions LOL! Thanks so much, dear!! Will head to Mercury Drugs tom and start repairing little Shi-O! Hugs! Benzac is an other great suggestion to cure her. I use it often to remove stains on my dolls and it works great. Just have a little patience, let her take some sun baths with the cream on (be careful to not apply the cream on painted parts of her face) and she will be cured. Vana! Thanks so much, dear! Yes, the made to move can be a great candidate body lender for her but I may need to research on how to remove the ball on her neck first tee hee..
You guys are so sweet about tipping me on this Benzac that I will get super soon! I'm looking at Shi-O now and she looks happy to know that she is gonna get back her old unstained face again.